Seven inmates were killed and 17 others injured in a riot at a maximum security prison in South Carolina overnight, one of the deadliest outbreaks of prison violence in the United States in decades, authorities said Monday. Fights among inmates erupted Sunday evening at the Lee Correctional Institution in Bishopville, South Carolina, and were brought under control at 2:55 am on Monday. 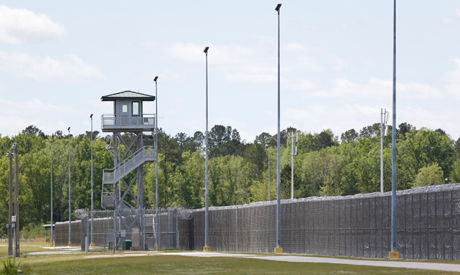 "The incident at Lee CI resulted in 17 inmates requiring outside medical attention and seven inmates were killed," the South Carolina Department of Corrections (SCDC) said on its Twitter account. "The incident involved multiple inmate on inmate altercations in three housing units," it said. Lee Correctional Institution, which holds nearly 1,600 inmates, is a "Level III" maximum security facility built in 1993 to house violent offenders and prisoners with behavioral problems. South Carolina's prisons are notoriously violent, however, and suffer from chronic understaffing. According to The State newspaper, the number of inmates killed in South Carolina's prisons more than doubled in 2017 from the previous year. It said 12 inmates were killed by other prisoners last year, up from five in 2016. The deaths included four inmates who were strangled to death by two fellow prisoners in April 2017 at Kirkland Correctional Institution, another maximum security prison. Representative Todd Rutherford, the leader of the Democratic minority in the state House of Representatives, condemned the violence. "A mass casualty incident inside a correctional facility is simply unacceptable," Rutherford tweeted. "Safety -- for inmates, SCDC employees, and the public -- must be a priority. "Rioting like this is a symptom our criminal justice system is broken and needs reform now," he said. The United States has the highest rate of incarceration in the world with around 450 prisoners per 100,000 residents, according to Bureau of Justice Statistics (BJS). There were 1.5 million inmates in state and federal prisons in the United States at the end of 2016, according to the BJS. The overnight violence at Lee Correctional Institution was the deadliest at a US prison in 25 years. In 1993, nine inmates and a corrections officer were killed at the Southern Ohio Correctional Facility, a maximum security prison in Lucasville, Ohio. After a four day standoff with inmates holding 42 hostages, New York state police moved in to retake the prison on orders of governor Nelson Rockefeller. By the time it was over 43 people were dead, including 10 guards and prison employees and 33 inmates.